Learn how to backup DVD, and copy/burn videos to DVD. And DVD Backup Software is quite necessary for most of movie fans. DVD backup software is more and more used by users at this age. You may have listed some reasons for put away your precious DVDs and want to get something to replace. DVD video offers high video quality but also with a lot of requirements. First, it requires a DVD drive and a MPEG2 decoder. Second, each DVD-Video disc contains one or more region codes, denoting the area(s) of the world in which distribution and playback are intended. The commercial DVD player specification dictates that a player must only play discs that contain its region code. Third, it is not as convenient as many videos could be directly stored in computer. This excellent video format also is with a lot of other requirements. So, use DVD backup software to backup DVD content into personal computer hard disk drive has been an absolutely necessary for most of movie fans. To backup DVD content to personal computer, DVD ripping software should be the right software for you. DVD ripping software could rip the content of DVD into popular video format which could be played very well on your computer screen. #1 WinX DVD Ripper, the best free DVD ripping software for Windows, could be the most suitable DVD backup software for you. It supports multiple DVD resource, including normal DVDs, CSS protected DVDs, commercial DVDs, Sony ArccOS DVDs, all region 1-6 DVDs and most of popular video formats such as FLV, AVI, MP4, WMV, MOV, MPEG1/2 as output video formats. 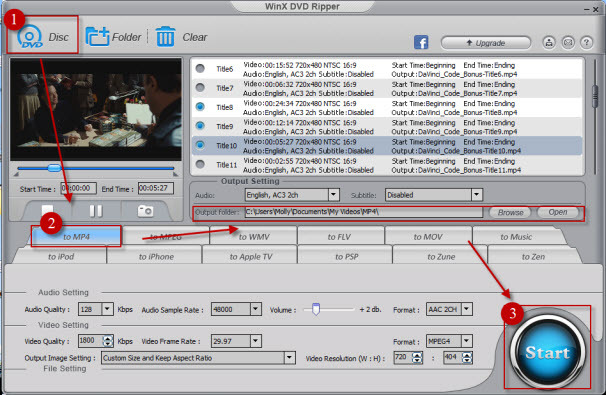 #2 WinX DVD Ripper Mac Free, the best free DVD ripping software for Mac, compatible with Mac OS X Leopard - macOS Mojave, can rip various DVDs to MP4, MOV, MPEG, FLV, MP3, JPEG, BMP. It can also backup the whole content of DVD to iTune. Helps you backup any DVD movies to digital video/audio foramts to playable on iPhone iPad Android PSP etc. After loading DVD, the DVD's information, such as title, subtitles, duration, output etc., will be shown in the file list. Choose the DVD file, click "AVI, MPEG, MP4, WMV, MOV or FLV" button to select an output video format. Click "Browse" button in setting panel, select a destination folder in the dialog box that opens, and click OK.
After finishing the above settings, check the files needed to convert in the file list, and click convert "Start" button on the main interface, to start converting the files. You can view the conversion progress from the progress bar at the bottom of the window. You can try the WinX DVD Ripper Platinum (the platinum edition of WinX Free DVD Ripper to backup DVD to AVI) is a nice solution to backup copy protected DVD movies. As a professional DVD ripping tool with many an attraction, WinX DVD Ripper Platinum is ultimately chosen by people for the fact that it can rip protected 20th Century Fox movie DVDs to MP4, AVI, H.264, MPEG, WMV, MOV, FLV, etc, with absolute original high video audio quality within minutes, delivering the best VFX. Higher grade PC settings (OS, CPU, RAM, etc) will result in faster DVD ripping speed for 20th Century Fox movies.